Come see my latest steel sculpture, 'Fair is Foul and Foul is Fair", an homage to Macbeth! EARRINGS GALORE 2017 My 'Potential' earrings series will be featured in Earrings Galore 2017 at Heidi Lowe Gallery in Rehoboth Beach, DE through December 30th. There will be an opening reception May 10th, 2017 from 6-9pm. 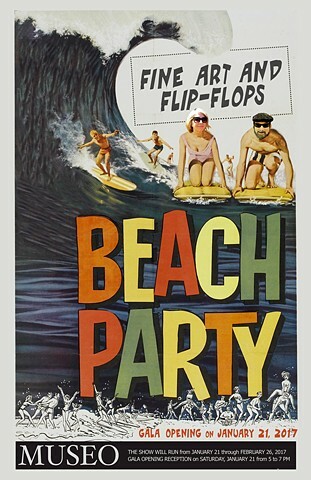 Join us for a Gala opening of "Beach Party" January 21, 2017 at Museo Gallery. 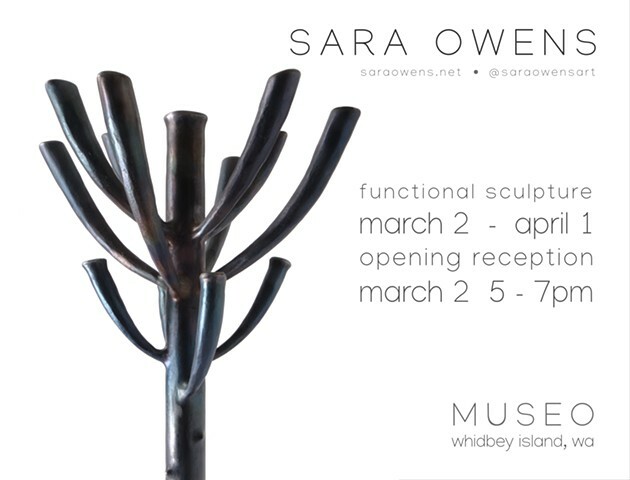 In addition to the beach themed festivities and art, I will be presenting my latest work, "Flotsam Dwellers," which is part of a series of seven oars, each one created by a different artist. 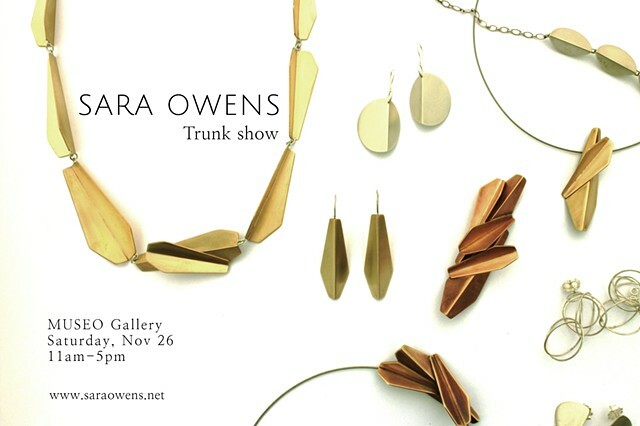 I'm having a trunk show featuring new work at MUSEO Gallery on Saturday, November 26, 2016, 11am-5pm. There will be also sale on past limited edition work. Come say hi, have a refreshment and check a few things off your holiday list! My work will soon be showing at Ombré Gallery. Ombré Gallery is a new contemporary art jewelry gallery opening in Cincinnati just in time for the holidays. MARDI GRAS is currently on exhibit at MUSEO Gallery through February 28, 2016 in Langley, WA, featuring new jewelry with colorful gemstones! 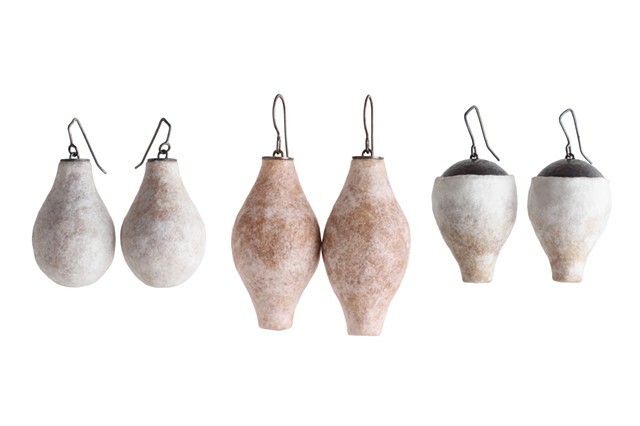 EARRINGS GALORE 2015 My coffee filter earring series and oxidized cold-formed earring series will be featured in Earrings Galore 2015 at Heidi Lowe Gallery in Rehoboth Beach, DE through September 15th! SCULPTURAL FELT INTERNATIONAL is now currently on exhibit at Tamworth Regional Gallery, Australia through July 18, 2015. SPRING SALE 30% off at MUSEO Gallery March 7 through March 31, 2015 in Langley, WA, as part of the Art of Provenance show and sale. Can't make it to Whidbey Island, WA? My ETSY SHOP will be listing most items for 30% off from March 9-31. -POP ART is currently on exhibit at MUSEO Gallery through February 28, 2015 in Langley, WA, featuring my new pop art jewelry: re-purposed sunglasses, chainsaw earrings and more! -Sculptural Felt International is now currently on exhibit in Horst, Netherlands at the Museum de Kantfabriek through April 12, 2015. My newest body of work is part of an international 3D felt exhibition which brings together artists around the world who are pushing the boundaries of traditional felt making. Visit the Sculptural Felt International Facebook page for more information and updates. -MEDIEVAL Opens Saturday, January 25th from 5 to 7 pm. The exhibit will run through February 24th, 2014. My new line of work inspired by medieval manuscripts, architecture and armor is on view at MUSEO Gallery in Langley, WA in conjunction with a group exhibition of works inspired by Medieval times. Over 30 artists have been creating works reminiscent of this period of the Middle Ages. Join us for a revival of the times between the 5th and 15th centuries through imaginative works. Find the perfect gift! A nice selection of my jewelry is now available at the Kirkland Arts Center Store in Kirkland, WA and the Pendleton Center for the Arts in Pendleton, OR. Give the gift of handmade art jewelry! I have some new work at Museo gallery perfect for holiday gifts or treat yourself! Join me for the artists' reception Saturday November 2nd 5-7pm. The exhibit will run through December 30, 2013. Come visit my studio during this annual Whidbey Island event showcasing the creative spaces of Artists throughout the island. I, along with the 8 other artists at Freeland Art Studio will be inviting the hundreds of art lovers into our shared space with snacks, refreshments and lively conversation! Make a weekend of it! Enjoy all the marvellous restaurants, wineries and Inn's that Whidbey has to offer. Join me Saturday, August 3 for a reception introducing my work in Museo Gallery, Langley, WA on Whidbey Island. I will be showing sculptural works as well as my new "Reconstruction" line in sterling silver. Featured artists also include painter Kathe Fraga and glass artist Elaine Michaelides. The exhibit will be up for the whole month of August. Come see my studio and the shared space of 8 other artists for an “After Hours” Open House Event on Thursday June 13. Click here for more information. There are plenty more events on the way with the Whidbey Art Trail kicking off it’s new year on June 1st and the Whidbey Open Studio Tour August 24-25, 2013. Check out the Artists' Virtual Gallery at Whibey Life Magazine. April 2013 features my work along side the talented sculptor, Jan Hoy. While your there, check out the rest of the site. 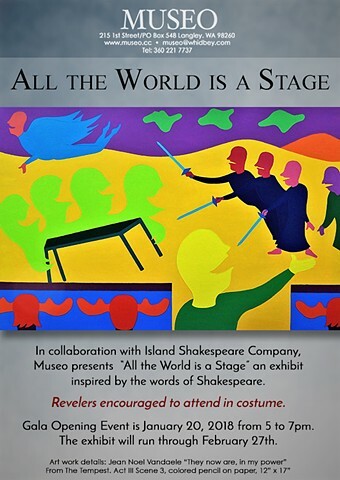 It's an excellent resource for connecting with the rich arts and culture of Whidbey Island. New Limited Edition Jewelry Line! Check out what's new on the Jewelry Page. Many of these pieces come from the dissection and recombination of a domed form, with a stone accent added here and there. Nov 2012 - New Exhibit at Miro Tea! I've been invited to have my work in show at Miro Tea in Seattle, WA through the month of November. This show features an eclectic collection of wall sculptures by 5 Seattle based artists including Isaac Quigley, Erin Campbell, Cheryl Freece, and James Lobb. Stop by during Ballard's Artwalk, 2nd Saturday (Nov. 10) for the opening reception.